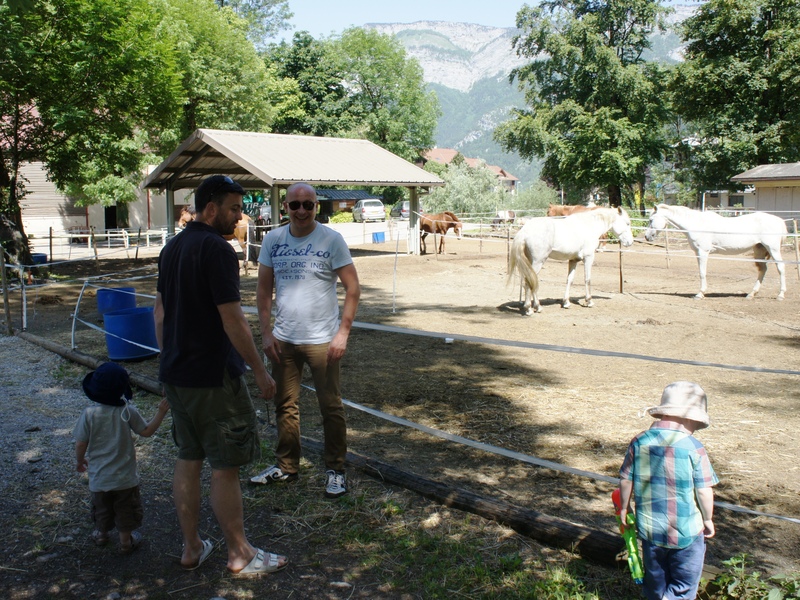 On a roasting day in Annecy, at the end of June, with my brother, his wife, my daughter’s godfather and some of our children all aged four and under, we decided to venture up to the relative freshness of the “parc aventure” in Thônes, before hitting the beach in Menthon. Yes (unsurprisingly) all our children are early risers and at 10 am you feel like you’ve already had a full day! The area is beautiful and wonderful for hot days – all nestled nicely under shaded trees. The horses are gorgeous and look like they are well looked after. 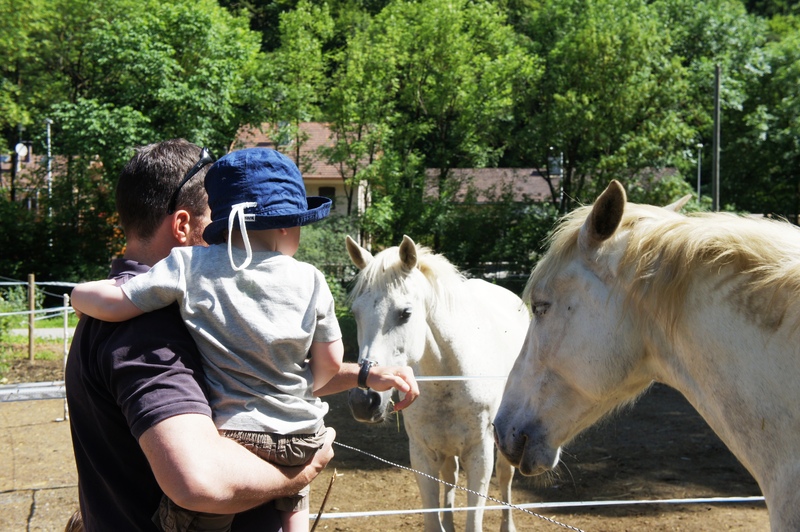 Pony rides are on offer on Wednesdays, weekends and school holidays. 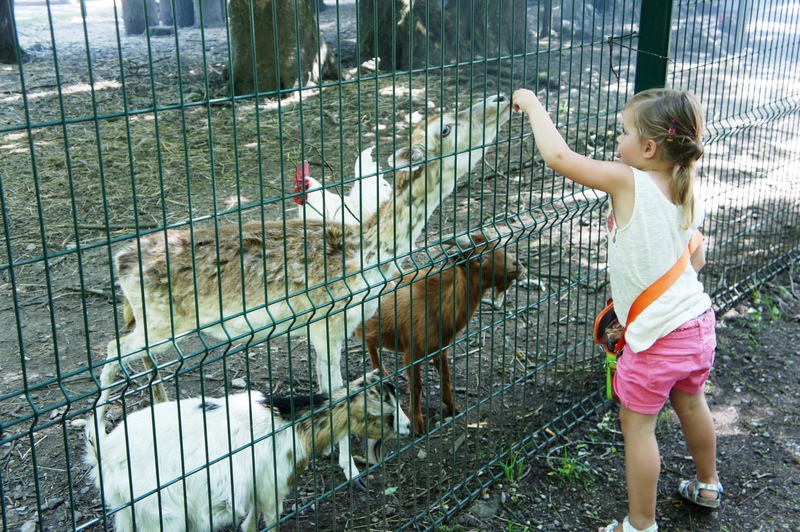 Unfortunately the “parc aventure” was closed on a Monday, waiting for the school holidays. But it does look great. They take kids from 3 years of age, accompanied with an adult. My daughter has been several times with her grandparents and LOVES it (they have actually bought her a summer subscription!). Its well worth a venture if you’re kids are super active and you’ve had enough of the beaches, or just fancy something different! Afterwards we ventured down to Menthon beach – which is beautiful, relatively quiet and free (I’m not sure if this changes once the summer holidays kick in? ), with lots of shaded areas under the trees to set up camp with little ones. There is a small enclosed swimming area which is perfect for them to explore, under supervision. It’s pebbly, so little jelly shoes may be handy. The café/restaurant is good with great salads , the “usual” French kids menus (steak haché/nuggets/frites) and a large selection of ice creams (of which they stock approx. only 30 % in June ;-)) There are public toilets, which are OK – even if the majority are still the old fashioned hole in the ground version – Yes they still exist !! There is also a small play area with a slide (handily put in direct sunlight so it becomes very hot, very quickly – when the sun comes out that is!) and a merry go round affair. Parking is free & accessible – although this is probably a different story once the summer kicks in. Also worth mentioning for parents with babies or active toddlers – it’s a nice flat walk down to the port, which is great for settling babies or tiring out youngsters on bikes/scooters. Info spot on for ideas of what to do with the kids and visitors. Look forward to next instalment.